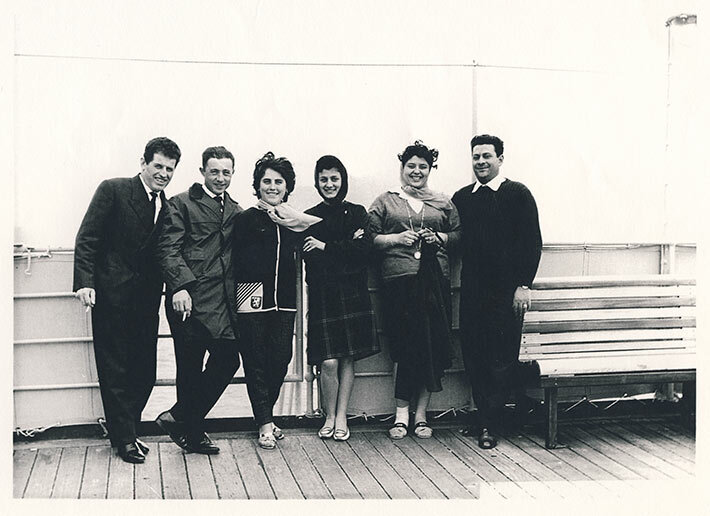 Black and white photograph showing a group of three women and three men, identified as Gabrielle Arrizza and family, posing on the deck of the Vulcania. The MS Vulcania was an Italian ocean liner built by Cantiere Navale Triestino, Monfalcone, northern Italy in 1926 for the Italian company, Cosulich Line. The ship sailed from Trieste on December 18, 1926 on her maiden voyage to Patras, Naples and New York. In 1941 the ship was used by the Italian government to carry troops to North Africa. The ship was again used by the government during World War II on three missions to repatriate women and children from Genoa to East Africa. In October of 1943 the ship was used by the United States government to transport troops. She was last used as a troopship in October of 1946 and was returned to the Italia Line. According to the archives at Pier 21 in Halifax, Nova Scotia the Vulcania stopped at the following ports: New York, Boston, Halifax-Ponta Delgada, Lisbon, Casablanca, Gibraltar, Palma De Mallorca, Barcelona, Cannes, Genoa, Palermo, Naples, Patras, Venice and Trieste.